When it comes to e-book apps, you typically come for the quality of the content, not the app itself. Johns Hopkins University has recently launched a new Psychiatry Guide, in the tradition of its other apps on antibiotics, OB/GYN, and diabetes, on the Unbound Medicine e-reading platform. The guide does have some use for medical students, psychiatry residents, and those looking to brush up on their clinical pearls. And, unlike many other e-books and mobile apps, the guide looks like it was made for the harried, on-call physician. The guide was written in bullet-list format but still provides complete sentences and even citations. 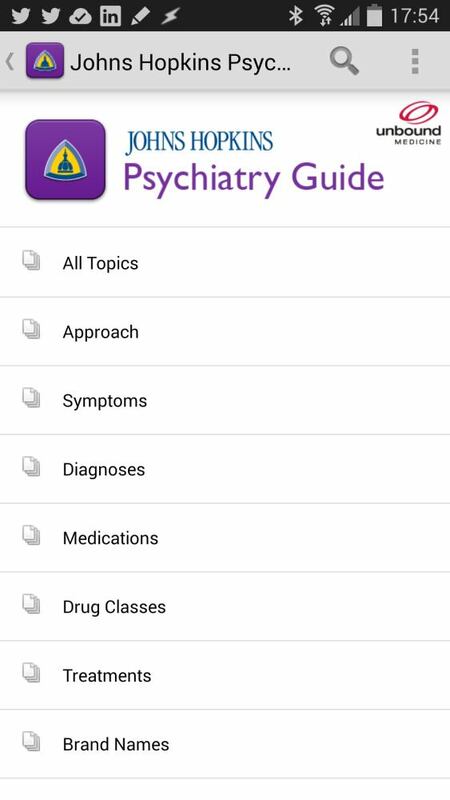 In a way, the app serves as psychiatry’s version of the popular Pocket Medicine handbook widely used by internal medicine students and residents. Even medications are laid out beautifully, comparing medications within class and even offering average price points with tablet dosages. Unlike Stahl’s Prescriber’s Guide, which dives into a cornucopia of details for every single medication, the Psychiatry Guide‘s medication pages compare and contrast medications fairly well. However, because they use wide tables, they are often difficult to read on the smartphone. Thankfully, it was easy enough to scroll around quickly on my 2013-era smartphone. I thought that some of the historical tidbits and pearls were very thoughtful: for instance, there is a nice overview of the DSM-5, including development history and criticism. 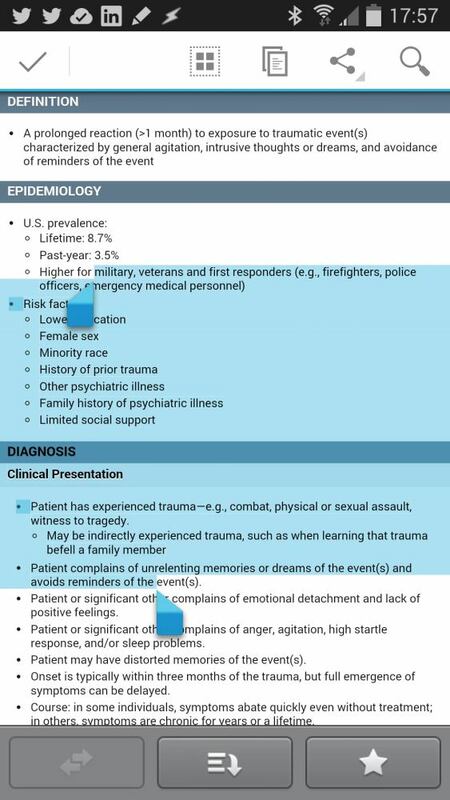 This helps doctors get up to speed in case they are ever asked by patients about the DSM-5. And, as a nice touch, the app works offline and doesn’t require an Internet connection. This is useful if you are deep in the bowels of your hospital’s ED, if you’re working in a rural area, or on travel missions abroad. The good news, also, is that the app takes up a very small footprint on your phone — less than 10 MB. Unfortunately, this also means there is no multimedia. 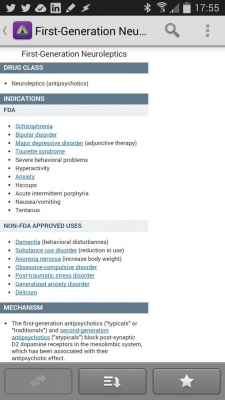 There are no links to already-online video content, which would be invaluable for things such as movement disorders, tardive dyskinesia, or dystonia, as those are side effects of some psychiatric medications. An unusual omission is the lack of information on mood stabilizers. 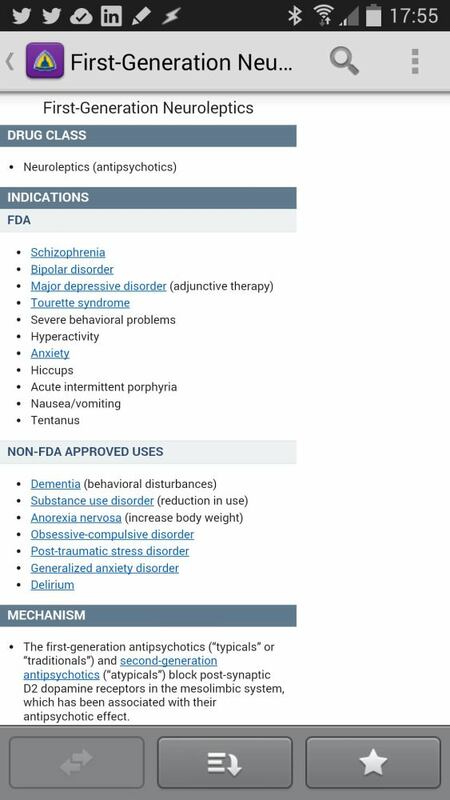 “Mood stabilizers” aren’t included under “Medications”, but in a separate section called “Drug Classes.” “Stimulants” are completely missing. Dosing information and even lab values important for medications such as lithium and valproate are not even provided. Unbound Medicine has an extremely fast search function. 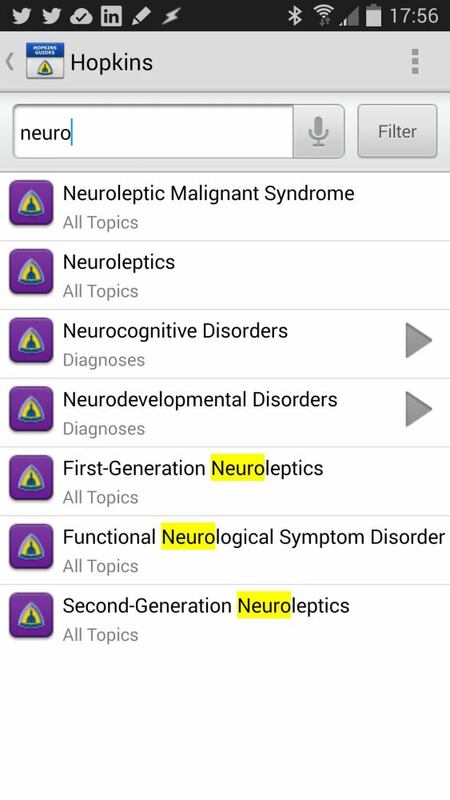 However, unlike the DSM-5 app, the search function does not recognize many common abbreviations, such as ECG or BPD. Even searching for “antipsychotic” does not bring up any entries. Unfortunately, the guide is bound to a rather anemic app provided by Unbound Medicine. The app’s user interface is still not up-to-date, even though Android 5.0’s new Material Design SDK has been available for nearly a year. As a result, the app looks and feels dated on the Android platform. 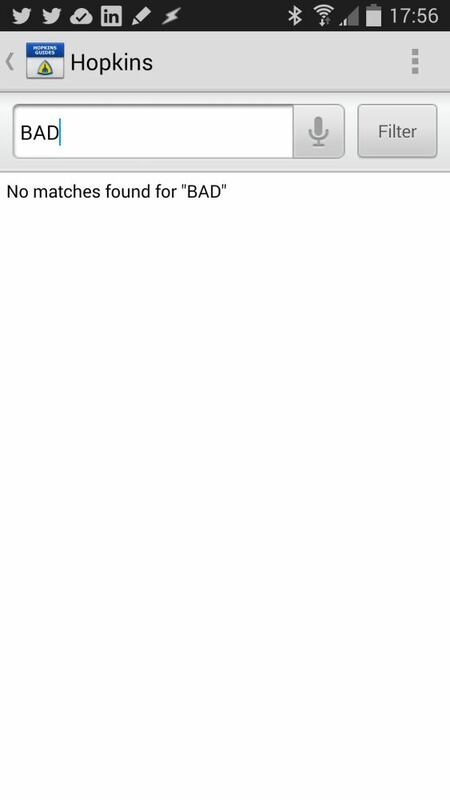 The app has major issues with accessibility. First, the Unbound Medicine app does not obey system accessibility settings for typeface size. Have difficulty reading the unusually small print? You’re out of luck as there are no local options for changing the typeface size without having word wrapping issues. For those who rely on TalkBack, the Android service for providing spoken feedback for blind and low-vision users, Unbound Medicine partially works but fails in some areas of navigation. You can at least navigate through with just your fingers, but because a lot of the buttons are unlabeled, you hear TalkBack speak back to you “Button 6,” “Button” and “Button” to describe the buttons. Touching the table of contents reads back a cryptic, “Index in Record List Image View,” then finally reads back the item you just touched. Aside from that, Unbound Medicine thankfully lets you copy and paste parts of the text — useful for sharing to SMS or Evernote — but lacks the ability to highlight or annotate text. It’s highly unusual for text-heavy apps to lack these functions in 2015 in the era of 2 GHz-powered mobile computers. In comparison, even MS-DOS applications like WordPerfect had highlighting functions. You also can’t “bookmark” individual parts of the page to your personalized Favorites, but rather the entire section. Thus, you end up only being able to bookmark long pages such as “Second-Generation Neuroleptics,” rather than individual medications. This isn’t the fault of the Johns Hopkins authors, of course, but all of these highlight how critical the e-reading platform is. And Unbound Medicine is not up to snuff yet. For $30, you will get access to well-written content. As a top-tier medical institution, Johns Hopkins delivers compelling content in a small package. Other books, such as the Massachusetts General Hospital Psychiatry Update and Stahl’s Essential Psychopharmacology Prescriber’s Guide, offer a more pleasurable reading experience and annotation features as they are available on Google Play Books and Amazon Kindle platforms, though both of those platforms offer limited to no copy-paste capabilities. This book is a “nice to have.” According to the authors of the book, more updates are on their way, and this book delivers pearls that I have not found anywhere else. 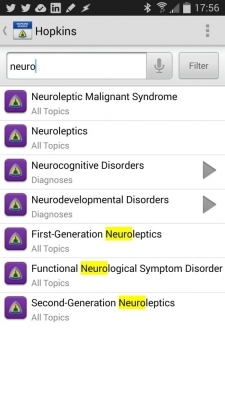 However, because of the omissions in this app, it’s best paired with other reference apps such as a DSM-5 e-book and a pharmacology app such as Epocrates or Medscape. Asides from its Find on Page functionality, does not take advantage of interactive smartphone capabilities. No multimedia or even links to already-online video content, which would be invaluable for things such as movement disorders, tardive dyskinesia, or dystonia. Easy to scroll; fast user interface. However, does not follow recent Android UI guidelines, and as a result, looks dated. Search function lacking. Does not take advantage of interactive smartphone capabilities. No multimedia or even links to already-online video content, which would be invaluable for things such as movement disorders, tardive dyskinesia, or dystonia. 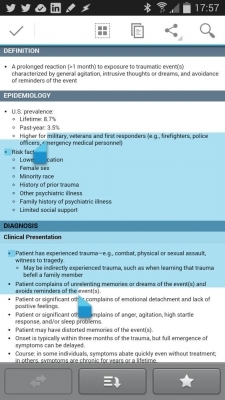 Cost is on the lower end of most clinical references for psychiatry, and you get material that you can’t find elsewhere. Useful for medical students, psychiatry residents and those looking to brush up on their clinical pearls, and made for the harried, on-call physician. However, does omit major details such as mood stabilizer dosages, stimulants, and other major concepts in psychiatry. 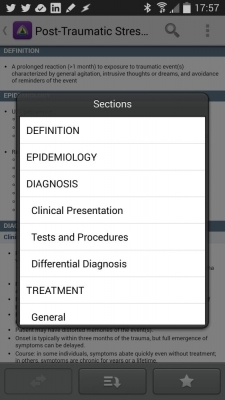 When a user has spent his $30 bucks for the app, has he purchased the app with lifetime updates (like Infectious Disease Compendium), or has one just purchased a 1 year subscription of access which evaporates on day 366 (like Sanford ABX guide)?